PS Vita Video Converter - How to Enjoy 1080p Video on PS Vita? Home » How to Convert 1080p Video to PS Vita ? How to Convert 1080p Video to PS Vita ? Having come across many problems when adding videos/movies to PS Vita for playback? Actually PS Vita (shorted of Sony PlayStation Vita) aims at hand-held games playing and as a result of which, many videos are not supported by PS Vita for playing. What's more, 1080p full HD videos are unavailable in PS Vita since its definition is 960 x 544 pixels. The lack of support for 1080p video playback turns the movie lovers down. So, if you are a hand-held games lover and movie lover, you may be interested if there is any way to playback 1080p video on PS Vita. Pavtube Video Converter is the best video converter for PlayStation Vita which helps you convert 1080p video to PS Vita for playback. What's more, as a great PS Vita video converter, the program also provides all kinds of output format and settings for many other portable devices like the new iPad, iPhone 4S, Amazon Kindle Fire, etc. How to shrink 1080p video to 720p for PS Vita playback? Step 1. 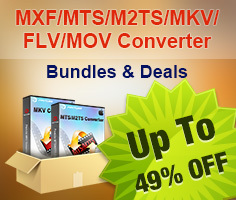 Load 1080p videos to Pavtube Video Converter. 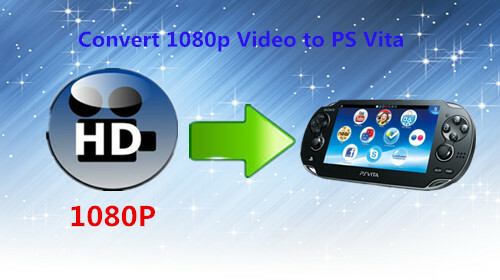 Click the add button to import full HD videos to this useful 1080p to 720p PS Vita Converter. Before converting, you can double click the file and preview the video in the playing window. 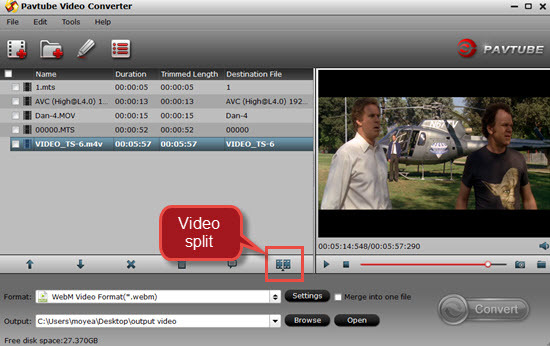 You can also click the split button to cut the video and export several video clips according to the time length, file size and file count. Step 2. Choose MP4 format for PS Vita playing. 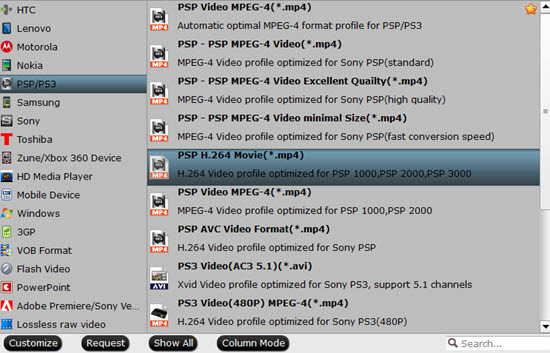 Pavtube PS Vita video shrink converter provides many format for output, you are recommended click the format bar and choose "PSP/PS3">"PSP H.264 Video (*.mp4)". Step 3. Optimize the profile settings. What are best settings for PS Vita video? 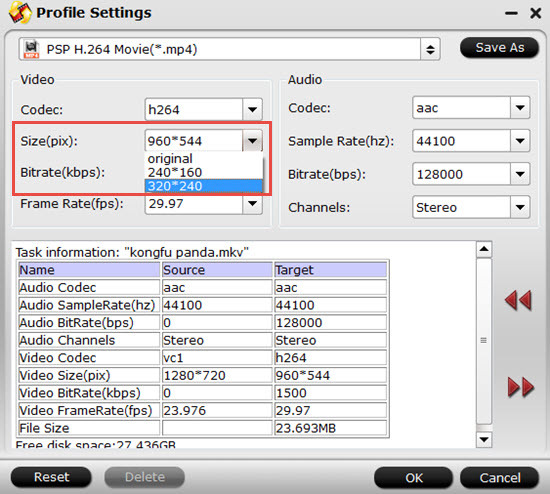 The default settings of PSP H.264 Video maybe not compatible with PS Vita, so you are allowed click the settings button to custom the video and audio parameters by yourself. Step 4. Convert 1080p to 720p MP4 video for PS Vita. After that, the last step you need do is to click the convert button to start to convert 1080p to 720p MP4 video for PS Vita playback with PS Vita MP4 converter. After the conversion finished, you can directly transfer the converted 720p MP4 videos to PS Vita for playback. AVCHD Tips - How to Play and Edit AVCHD (Lite) Videos? Will Canon EOS Rebel T6i/750D MP4 Become Friendly to FCP, iMovie, Premiere, Avid,etc? How to Enjoy MKV Movie on PS Vita? How to Encode AVI Videos for PS Vita?